Bill Robinson has announced that his 17th year as president of Whitworth University will be his last – making him the second longest-serving and one of the most influential presidents in the school's 120-year history. Walt Oliver, chair of Whitworth's board of trustees, said the board and the campus community deeply appreciate Robinson's outstanding leadership and service to the university. "During his 17-year tenure, Bill has championed Whitworth's distinctive mission to provide an education of mind and heart characterized by both Christian commitment and open intellectual inquiry," Oliver says. "This year's record freshman class demonstrates that Whitworth's mission is in great demand and that the university's enrollment and financial position are strong. That strength gives us tremendous confidence as we look forward to the next chapter in Whitworth's history." Oliver said a national search for Whitworth's next president will begin immediately. Robinson has agreed to serve until a new president is in place and will serve part time one additional year as president emeritus to support the new president in areas such as fundraising and constituent relations. Robinson became Whitworth's 17th president in July 1993 following seven years as president of Manchester College, in Indiana. During his tenure, the number of freshman applications to Whitworth has increased 518 percent to 5,862 for this fall; enrollment has grown 60 percent to an estimated 2,675 students; and retention and graduation rates have reached record highs well above national averages. More than $83 million in campus improvements have been made, including a new center for the visual arts, a landmark general academic building, three new residence halls and several outdoor athletics facilities. Financial support from alumni and friends has increased steadily, contributing to an increase of nearly $75 million in the university's endowment before the recent market downturn. 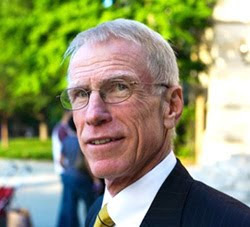 Known for his relational and approachable style, Robinson has devoted much of his energy to connecting in person and in writing with students, employees and friends of the university. His award-winning monthly newsletter, Of Mind & Heart, is read by more than 20,000 people inside and outside the Whitworth community and is one of Robinson's favorite vehicles for promoting Whitworth's distinctive mission. "Perhaps no president in Whitworth's history has done a better job than Bill Robinson of understanding and articulating Whitworth's unique educational mission to hold up Christian conviction and intellectual curiosity as complementary rather than competing values," says Vice President for Academic Affairs and Dean of the Faculty Michael Le Roy. "Bill's unwavering focus on Whitworth's mission to its students has provided the inspiration for the excellent trajectory the university is on and the foundation for even brighter days ahead. This is a tremendous legacy." Located in Spokane, Wash., Whitworth is a private liberal arts university affiliated with the Presbyterian Church (USA). The university, which has an enrollment of 2,675 students, offers 55 undergraduate and graduate degree programs.